Human beings have been using tools for over 2.6 million years, and our relationship with tools remains just as strong as ever. In the year 2011 it was calculated that the worldwide market for power tools was worth over $20 billion. In the current year, it is expected that the current value of power tools could rise as high as 8.1 billion. 31% of all power tools will sold in North America, 27% of power tools will be sold in Asia/Pacific, 26% will be sold in Western Europe, and 16% will be sold in other places. With all of the tools that are going to be sold, the demand for toolboxes isn’t going to get any smaller in the near future. The following products have been rated as some of the most durable, reliable, and high-quality toolboxes available on the market for DIYers around the world. 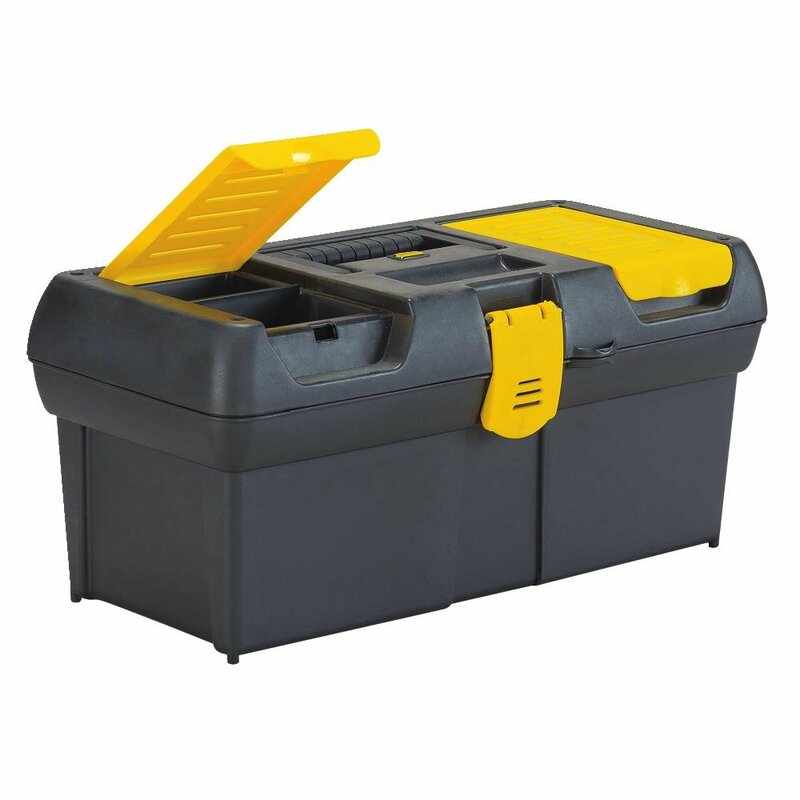 The Stanley FatMax Structural Foam tool box has been designed with an extra-large capacity. The product features an all-around water seal which allows the equipment inside to be adequately protected from the elements. The large metal rustproof latches and padlock increase the security of the tools inside. The hand-lifting recesses have been made for optimal ergonomics, allowing the user to more comfortably carry heavy loads without much strain. To increase the ease of carrying even more, the handle is made with a soft-grip. The FatMax features v-grooves on the top lid. The integrated v-grooves on the top lid are suitable for both pipes and lumber. The toolbox is made with plastic that has been heat molded, and the water seals have been made from soft rubber. Because of the heat molded plastic, this toolbox is vulnerable to sources of intense heat. One customer advises that if you intend on storing soldiering equipment, you must be sure to let equipment adequately cool down. The FatMax can be filled with water without leaking, though customers should be especially careful not to use any liquid that can corrode the interior. With the portable tote tray, it can carry hand tools and small parts outside of the main compartment. Due to the fact that the tote tray is only three quarters of the length of entire length, a larger amount of tool storage within the box itself is facilitated. The FatMax is ideal for carrying hand tools, power tools, and medium to large items. Larger items can be transported in the half tray The foam is made of thermoplastic resin and flake mica, both of which are highly effective for increasing the survivability. One customer testified that they were in the market for a large, tough, watertight toolbox that they could use to securely transport all of their camera equipment. The customer was in search of something that they could throw into the back of their jeep without worrying if it was left out in the rain with the top open. The customer was also interested in being able to use bicycle chains and their own locks for more security. The customer found that this toolbox provided them everything that they were searching for. The customer testified that the structural foam felt solid enough to take all of the abuse that they expected it to endure. 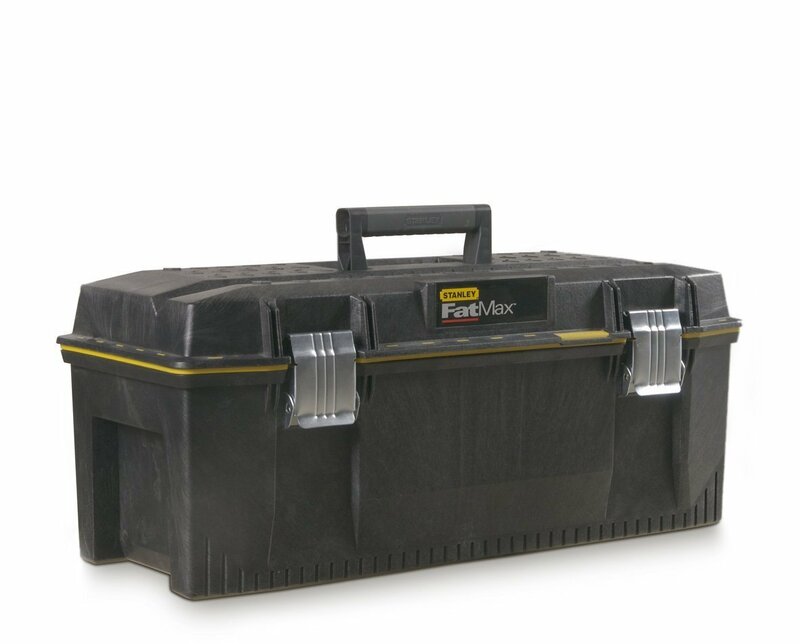 The customer felt that the FatMax was sturdy enough for them to stand or sit on it without any in the slightest.The customer also reported that the product label on the front of the toolbox can be easily removed without leaving any residue. Most of all, the customer was pleased with the fact that this toolbox did not seem to be something that could be easily stolen. The customer was impressed enough with its quality to purchase a second FatMax. The dimensions of the FatMax are 28 x 12.6 x 11.6”, and it weighs 9.8 panels. It can be purchased for the price is $33.99. 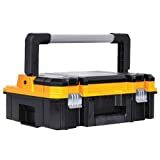 The DEWALT DWST17808 TSTAK I long handle toolbox organizer gas been designed with a flexible platform that allows different combination configurations. Each of the units is connected with durable side latches, and all of the units can stack on each other. The Dewalt’s features include cover cups, ball-bearing slides, and heavy-duty metal latches/hinges. The Dewalt is made with a bi-material handle on the top that allows it to be comfortably lifted without strain. The metal latches had been specifically made for rust-resistant, which allows them to survive being exposed to the rain. Customers should be advised that the Dewalt will not stack with the DWS Tough System cases. The height of the bottom compartment is 3.5” is on the bottom, and the top adds an additional inch. Customers have found that these measurements are ideal for being able to see all of the tools inside without having to do much digging. Essentially, the collective Dewalt system is composed of six carrying cases within optional dolly cart. Customers have testified that the product is very well thought-out in terms of its usability and convenience. One customer testified that they were particularly impressed with the drawer racks in the latches, which allow the toolbox operate to operate smoothly. The customer found that the drawer label provision was very convenient for allowing them to print their own labels and cut them out seamlessly. The customer was also highly impressed with how the boxes could interlock and latch together so simply. Everything from the colors, textures, and durability of the plastic made customer confidently consider the Dewalt to be one of the better investments that they had made. On the other hand, the customer did note that the structure of the box did leave something to be desired in terms of practicality. The customer noted that the shelf on the bottom drawer was bowed upwards, which meant that the bottom drawer dragged on it. The customer also found that the supporting feet are positioned in such a way that the lower shelf bows up more, especially when heavier tools are loaded into the toolbox. The customer noted that this is not a problem when the drawer box is stacked on top of other TSPAK boxes, due to the fact that the bottom feet are not being used. The customer suggested that these drawbacks could potentially be bypassed by purchasing a roller base. The customer themselves chose to purchase four custom-fitted wooden seat to affix to the bottom box, which allowed the structure to be supported on the sidewalls. Aside from the drawbacks, the customer found that all of the convenient features of the toolbox were sufficient enough to give it four stars. The product’s dimensions are 17.3×13×7.3 inches, and it weighs 4.8 pounds. The toolbox can be purchased for the price of $21.99, a 40% discount from its standard list price of $42.00. The Stack-On SHB-16 16-Inch multi-purpose steel tool box features nickel-plated, steel draw bolts. The nickel-plated steel draw bolts allow the SHB to handle heavier loads with minimal problems. For greater strength, the toolbox has been constructed with rugged all steel end caps. The SHB also features a full-length, staked piano hinge. The toolbox is outfitted with durable baked epoxy finish, which allows it to resist arresting and solvents. For frequently used tools, there is a lift out steel tray included. 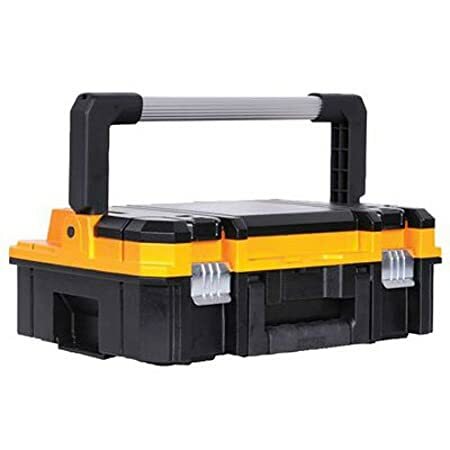 Customers should be advised that unlike rubberized plastic toolboxes, this SHB does not seal water-tight. Because it does not seal water-tight, it is not a good idea to expose the SHB to the elements for an extended period of time. As long as it isn’t raining, the toolbox can be conveniently mounted onto a tractor. One customer testified that they were pleased with the SHB for its well-built, uncomplicated design. The customer described the SHB as having an incredible amount of value for anyone who is looking for a simple, all-steel toolbox that is completely manufactured within the USA. The customer testified that the interior of the tool box is undivided, with the exception of the accessory tray that sits on the top. The customer testified that though the tray made out of plastic, it is still satisfyingly sturdy. The customer was surprised that the durable tray was entirely USA-manufactured. The handle of the toolbox is made of metal, though customers should be advised that the interior is hollow. The customer found that despite the fact that the handle is hollow, it was still strong enough to bear all of their heavy-load tasks. The customer was so impressed by the handle that they confidently claimed that it might be reason enough alone to purchase the toolbox. In the past, the customer has struggled with other toolboxes using plastic handles that were often times susceptible to being compromised during heavy tool loads. Due to the fact that the handle is completely made of metal, along with being attached to the lid with strong welds, the customer never had to worry about the possibility that the handle might suddenly break apart due to an excessive amount of weight. The full-length, piano typing hinge contributes to the strength of the handle. The customer noted that the latch is a double compound type. The customer initially worried that a simple latch might accidentally be caught open on clothing, which could cause them to drop all of their tools. Due to the fact that this toolbox features a double compound latch with a retaining loop, the customer has an ample chance to properly latch the toolbox once again, due to the fact that the lid will only open a quarter of an inch even if it is accidentally opened. Because many manufacturers are completely willing to cut costs by only using a simple latch, the inclusion of a double compound latch shows a great deal of customer consideration. The dimensions of the toolbox are 16 x 7 x 7.5”, and weighs 5.2 pounds. The toolbox can be purchased for the price of $19.99. The Stanley Series 2000 16-inch tool box is designed with two lid organizers that can be used for small parts storage. The two lid organizers make the small parts accessible without having to open the main compartment of the toolbox. The Stanley Series features a padlock eye, with small locks, that helps the customer more effectively keep their tools secured when the toolbox is not in use. The handle of the Stanley Series has been made with a soft, wide rubber-coated handle that allows the toolbox to be easily transported with maximum ergonomic comfort. The Stanley Series features strong nickel metal-plated latches as well. The lower compartment, with the tray in place, is approximately 3 inches deep at the bottom. Customers have testified that this is a small budget product that works relatively well for its price. One customer testified that they purchased two of them: one toolbox was purchased to hold a Chicago electric multi-tool, and the other toolbox was purchased in order to hold the same brand of a 4.5” electric angle grinder. The customer reported that both were able to fit with the blades attached, although the inside tray didn’t fit with the angle grinder. The customer reported that there was still plenty of room for accessories. The customer was also pleased with the four nubs on the bottom of the Stanley Series, matching the recesses on the top, which allowed multiple boxes to stack very easily. No matter what toolbox you choose, it is highly likely that it’s going to have to withstand a great amount of wear and tear in the line of duty. The tools being jostled about in the interior have potential to cause damage over time. Toolboxes are often left outside, at the mercy of the elements, which means that having a strong, weather-resistant material is imperative for any DIYer with large outdoor projects. Aluminum is one of the most popular choices for its durability. In addition to being durable, aluminum is also conveniently lightweight. aluminum is lighter than plastic, but has a slightly higher rate of survivability. Steel on the other hand, is a much more heavy-duty than aluminum. Steel is often slightly more expensive than aluminum, though at the same time, it is also easy to care for and has the highest rate of longevity. If you are simply looking to do simple home projects, then a plastic model is one of the quickest and effective ways to keep your tools stored relatively inexpensively. Plastic is not as heavy-duty as the other materials, but if you don’t expect your toolbox to take a very much abuse, it may be one of the more economical options. No matter what material you need, it is generally always a good idea to ensure that the lid can be locked for security. In addition to having a toolbox that can properly carry the amount of tools that you need to, you must also be sure that the one you choose is conveniently portable and able to be easily stored. If your toolbox isn’t going to be moved around much, then the weight will be as much of an issue. You can store many tools in the larger models without having to worry about the strain of picking up and carrying it. On the other hand, if you plan on taking it to different places on a regular basis, you’re going to want a toolbox that can strike an effective balance between being both lightweight and durable. Naturally, before choosing a brand, you are going to want to ensure that you are able to carry the appropriate amount of tools that you need for any particular project at any time. Different toolboxes will offer distinctly different levels of holding capacity, and the effectiveness of each of these capacities will depend on your particular needs. Often times, the higher-end models will be able to make your storage more convenient by offering a more comprehensive array of options for organizing the tools with in the box. The larger the scale of your project, the more that you’ll need to ensure that the storage of your toolboxes up to par. In the same way that it’s important for a student taste to protect the integrity of your port valuables contained inside, it is equally important to ensure that the toolbox is capable of protecting your important tools from any of the elements that may damage them over time. The more high-and models will often feature implements that allow it to protect all of your important tools from water damage. Certain models will also feature rustproof latches that allowed the toolbox to retain its state of durability and stand the test of time. In addition to the basic functionality of storing tools, certain toolboxes will also feature additional convenient implementations to make the storage much more convenient. Certain models will allow you to use special lid organizers for small parts that can be accessed without needing to open the main compartment. There may also be padlocks that can be useful for increasing the security of your tools. The handles of certain toolboxes may be specially designed to make them more ergonomic as well. The best toolbox that you can buy will be convenient for far more reasons than just being able to store your tools. The most deluxe products will have a number of features that make the process of storing your tools much more convenience and organized. In order to store your tools in a secure fashion, the safety of the tools inside and the durability of the exterior must be properly optimized. The level of durability that you need will, naturally, depend on how many tools you are storing and how much abuse you expect the casing to take. Before starting any project, you must make a point to develop a strong profile of exactly what the needs for your toolbox are. Making the correct choice can be the difference between a nightmare project and a dream project.